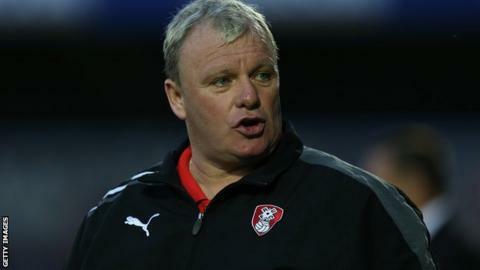 Rotherham manager Steve Evans has been given a six-match stadium ban and fined £3,000 by the Football Association. Evans was found to have used abusive and insulting words and behaviour with a reference to gender during a League Two match between his former side Crawley and Bradford City in March. The match finished with ugly scenes as a mass brawl led to five players being sent off in the changing room. The 49-year-old does not intend to appeal against the decision. He said in a club statement: "I am very disappointed by the decision, however for the good of Rotherham I accept the verdict and will move on with no further comment." Evans left Crawley for Rotherham two weeks after the incident. The ban prohibits the Scot from attending the ground at which his side is playing at any time during a match day, starting with Saturday's home clash with Torquay.